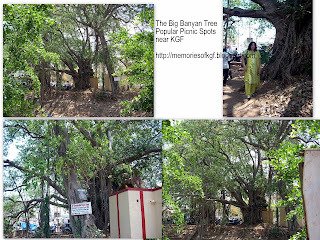 The Big Banyan Tree just outside KGF, on the KGF - Bangarapet Road, (close to where the Bharat Earth Movers Ltd., factory stands today), was a popular picnic spot in the good old days. 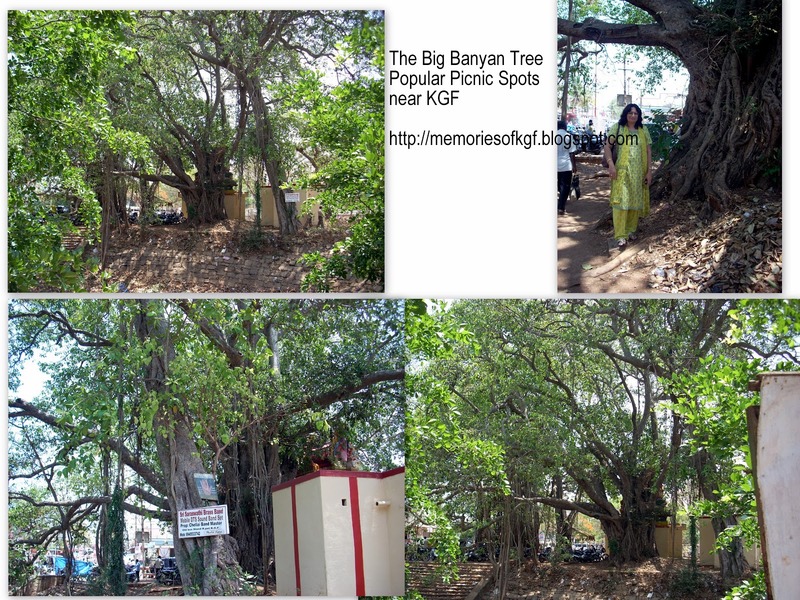 On Sundays and holidays many Families from KGF would pack up snacks, sandwiches and drinks and head to the ‘Big Tree’ as it was fondly known. to spend the day there and then return home in the evening. 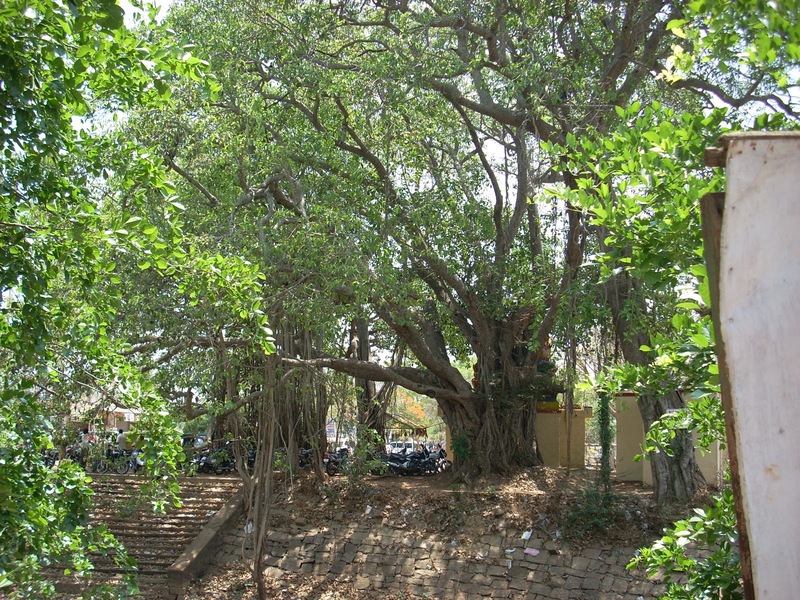 The Big tree was also the place that most newly married couples drove to after their weddings before the reception just to spend an hour of quality time together as new man and wife. In those days, the surroundings were calm and serene with hardly any traffic or pollution. There was a huge natural pond neat the tree and the water was always fresh and cool. While the elders relaxed and enjoyed their beer and cool drinks and exchanged gossip, the children would enjoy themselves hugely running and catching and teasing each other and riding the cycles that they hired by the hour from the nearby village Some of them would bring their swimming costumes along and take a cool dip in the pond. The Big Tree was also home to a number of birds especially big bats or flying foxes. When I was studying in St Joseph’s Convent, many school picnics were arranged at this idyllic spot, The students would be taken class wise or section wise and each student would bring their own picnic lunch. There were small shops selling jaggery toffees, Jigg nuts (ground nuts), cut mangoes with chillie powder, panichakke etc. After stuffing our selves with all this forbidden trash and eating our home packed picnic lunch besides playing and shouting ourselves hoarse, we’d return home tired, happy and sun burned after our long day in the sun. Sadly the Big Banyan Tree doesn’t look so big now. The pond which was sheltered by its branches is now dry. The traffic and sounds have increased and frightened the birds and flying fox away. Litter and garbage make this once beautiful spot an eyesore and its no more a Picnic Spot. Shops and houses and the BEML Colony have come up around its periphery and its as busy as the centre of town.